Let’s face it…it has never been just pixie dust, rainbows and unicorns in the world…especially as of late. There is war. There is famine. There is disease. Racism. Hatred. However, the reality is that our souls truly long for peace, harmony and love. Many people want to do something about what is going on in the world, but feel helpless to a certain degree and are angry and saddened by the injustice. They take some form of activism, but fight against or condemn what is wrong. Or they may feel that their life has been difficult and complain about everything constantly with little gratitude of the blessings and lessons of their experiences. The problem, is that you can’t fight negativity with negativity and it only continues and perpetuates the downward cycle. There is one missing ingredient – LOVE. Love is the highest vibrational frequency and it’s the strongest wave form that emerges from the hear. Acting as a transmitter of frequency, the heart contains an electrical field much stronger than the brain and a magnetic field drastically stronger than the brain. When you apply love frequency through your heart a wave of energy is projected outward which alters the holographic nature of our reality by anchoring us to timelines in higher dimensions which contains everything that gives us joy, excitement and a happy state of being. Everything is energy and carries a different frequency – emotions such as love, peace, harmony, compassion and joy have a very high frequency. Hatred, violence, greed, jealousy, guilt and shame has a very low frequency. We are all connected because we share a global consciousness and each of us contributes to that on a daily basis – every thought, word, intention, feeling, emotion and action contributes to the collective. The higher level of consciousness we have, the less violence, war, hatred as it will be harder to exist and manifest the lower frequencies. Simply put, the only way to wash away the darkness is by shining the light of love to cast out the shadows. This applies to us internally. We cannot resolve inner conflicts within ourselves with negativity. Self-love is what we need to pull us out of the dark. Love will also wash away the conflicts and troubles of others in our lives and open the possibility of harmony and peace. This individual consciousness also affects world conflicts. We must honor our divine will power and remember that we contribute to this collective consciousness every day. What are YOU contributing to it? 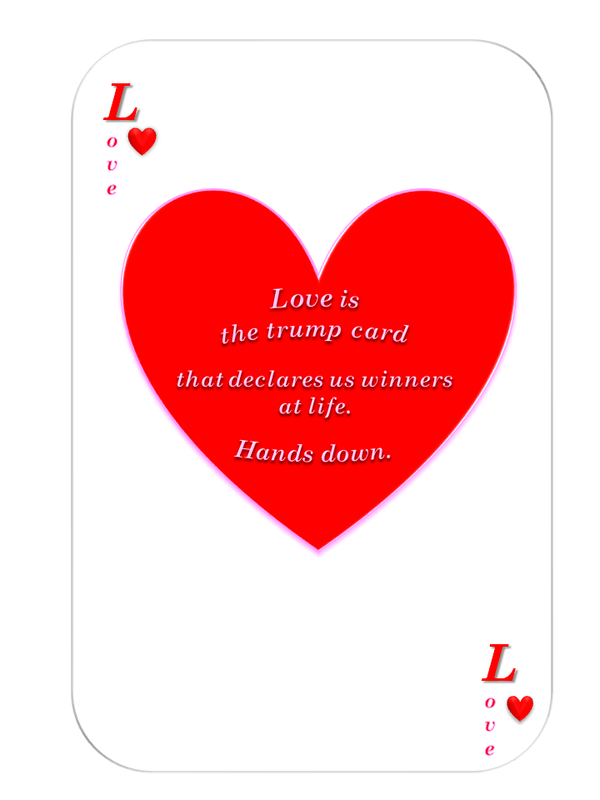 Are you spreading love or are you continuing to fight and struggle while forgetting about the powerful trump card of love? Change your world, change THE world. So send pink love light from your heart to the planet, especially the people who need it the most. Our dear friend Bob Marley knew we were all one! One Love! One Heart!